You might say the internet is more or less a virtual department store for ecommerce brands, but customer service still ranks as the No.1 factor impacting audience trust (and subsequently purchases). Service even outranks price. How can content marketing help retailers achieve high-quality service online? For our client in the beauty industry, we developed a blog to act as the friendly face behind their makeup counter. The product is relatively expensive, so the brand has to effectively explain the benefits and offer clear insights on using it for best results. The brand needs to be instantly perceived as friendly and helpful. Just as in an offline department store, several other beauticians are willing to share information about their product at the next kiosk (ie: website). A blog is the personal touch point that lets consumers know there are humans behind the brand, and they’re here to help – not simply to sell. A high price needed to be countered with educational content that validated the purchase. Not enough visitors were reaching the site, and too many bounced quickly. They needed to be better engaged with interesting reads. Create a blog that features beauty best practices, “how to” makeup tutorials and product features. Incorporate search-friendly headlines and organically place keywords throughout the pieces that audiences will find naturally in search results. Distribute and promote content on social media networks where target demographics are most active (Facebook and Pinterest). More traffic and higher quality visitors. Revenue brought in from Brafton content is 525% greater than the amount spent on Brafton’s content marketing services. Organic search has been a major success in this content strategy, Senior Strategist Wilfred Hirst said. Content that does well in search post Google Hummingbird is that which answers customers’ direct queries. Direct Brafton ROI: Users come to the blog as a point-of-entry, then make a purchase. 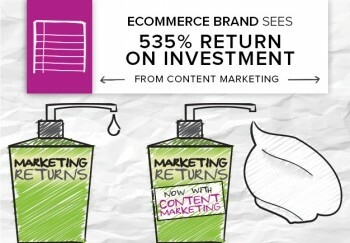 Indirect Brafton ROI: Users come to the website, find and read multiple blog posts, then make a purchase. 2. It maintains natural keyword placement. Keyword strategies are often overlooked, because they were taken advantage of and thus regarded as spam. While we’re not recommending keywords be thrown in unnaturally, it’s important to gauge the exact phrases and words within search that are bringing people into your website. Our writers’ topic brainstorms are a direct result of Google Analytics’ keyword research. Phrases like “break out” and “milk cleanser” become topics like, “Why do I break out when I’m sick?” or “Benefits of milk cleansers.” These are the types of specific queries people are typing into search. Getting people to your website is one piece of the puzzle. Getting them to stick around is what actually counts in SEO rankings. According to Moz’s 2015 Search Engine Ranking Factors Study , pages with poor user satisfaction metrics tend to rank lower in search results. For instance, a high bounce rate is a poor sign of user satisfaction because it means people who click through to the site immediately leave. It indicates the site doesn’t have the information they want or it’s unattractive and appears untrustworthy. In-line images, pull quotes and subheads and lists that break up text and add visual appeal. Recommended products in the sidebar that relate to the article being discussed. Related posts, so users have a clear navigation path once they’ve finished reading a post. For more on best practices with ecommerce blogs, check out this post on How a Few Sentences Helped Net 250k in Ecommerce Revenue. Molly Buccini is Brafton's community manager. She joined the team with a background in digital journalism and social media. She's a theatre nerd, pop culture junkie and lover of summertime.